Our resident SEO guru dishes the dirt on how to increase your visibility through PlantMiner and boost your chances of winning work. Your PlantMiner company profile gives you the opportunity to showcase your business and fleet on a site visited by thousands each day. Within a few clicks, our procurement platform allows renters searching for equipment to easily discover more about you and your machinery. A searcher’s hire decision is heavily influenced by your company profile and item descriptions. By improving the quality of information you offer potential clients, you are simultaneously increasing a searcher’s perception of your business and even growing how often an item appears in search results. Potential hirers want to see information that relate to their needs. So while most company profiles on PlantMiner use identical information to their personal website, these details are often aimed at a more general audience. It’s a simple and proven relationship – the more targeted content you add, the more you can influence a searchers decision and increase the number of enquiries on your profile. 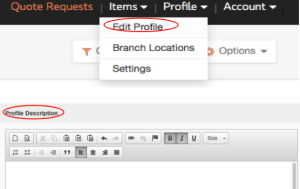 To make these changes, log in to your account and select the ‘Edit Profile’ option from the Profile dropdown in the navigation. The profile description can be edited at the bottom of the ‘Edit Profile’ page. You can then preview these changes before saving, or just save straight away. Your Client Manager is a great resource to help you update this information. Adding a short, unique description to important items can increase your chance of receiving direct enquiries and your likelihood to appear in PlantMiner search results. The greater the detail, the more likely it will match up to a hirer’s requirements. “Quick searchers” represent a quarter of PlantMiner’s renters – i.e. people who need one or two items (rather than a large tender request) for an immediate job. A ‘quick searcher’ is someone who types a request for equipment, for example ‘electric forklift hire’, into the search box without pre-selecting a specific plant and equipment category. When the site is used in this way, the results that show to the searcher are based on what the item title and description is. For example, If you listed your item as ‘Electric forklift’, you will rank higher than just ‘forklift’, as the first results would be more relevant to the searchers request. If you list your item as ‘forklift’ but include the terms ‘electric forklift’ within your item description, you will rank higher. By updating your item descriptions, you are increasing your chances of ranking higher in our item listing results. Only 10% of plant and equipment items on our site currently contain a unique description, so this method is a simple way we can give you a leg up on your competitors. 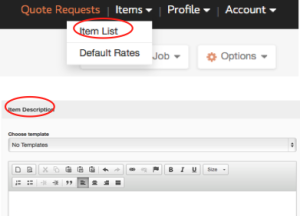 To make these changes to your items, log in to your account and select the ‘Item list’ option from the ‘Items’ dropdown in the navigation. You can select the item you wish to edit and click through to update the description. The ‘Item Description’ text box is found at the bottom of the ‘Item Details’ page. Please be sure to save the changes. As always, if you have any problems updating this information, please get in touch with your Client Manager. A link from your website to your updated PlantMiner profile can be of great worth. In terms of fleet listings, most sites give a broad sense of their machinery. However, your PlantMiner profile will offer searchers a complete list of your fleet, the descriptions of the machinery and matching imagery. We’ve also found that online users are reluctant to pick up the phone and much prefer to complete an online form. Your PlantMiner profile offers a simple way to receive direct enquiries about your company. We’re dedicated to provide a valuable service to PlantMiner suppliers. We want you to succeed and win work. It’s these small tweaks that can result in a searcher finding your equipment first.